(Amesbury MA) Amesbury was in trouble. 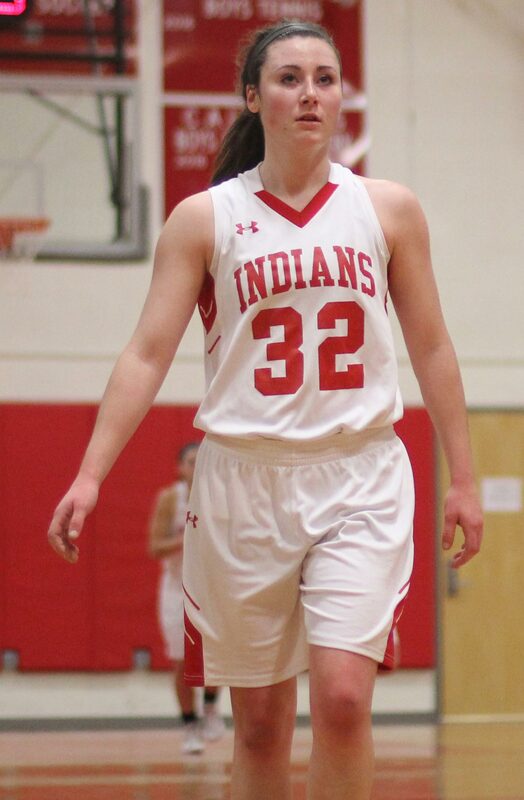 Tied with North Reading (27-27) 2 ½ minutes into the second half, and having top scorer Flannery O’Connor and starter Julia LaMontagne benched with foul trouble, the #1 seeded Indians appeared headed for a short post-season. 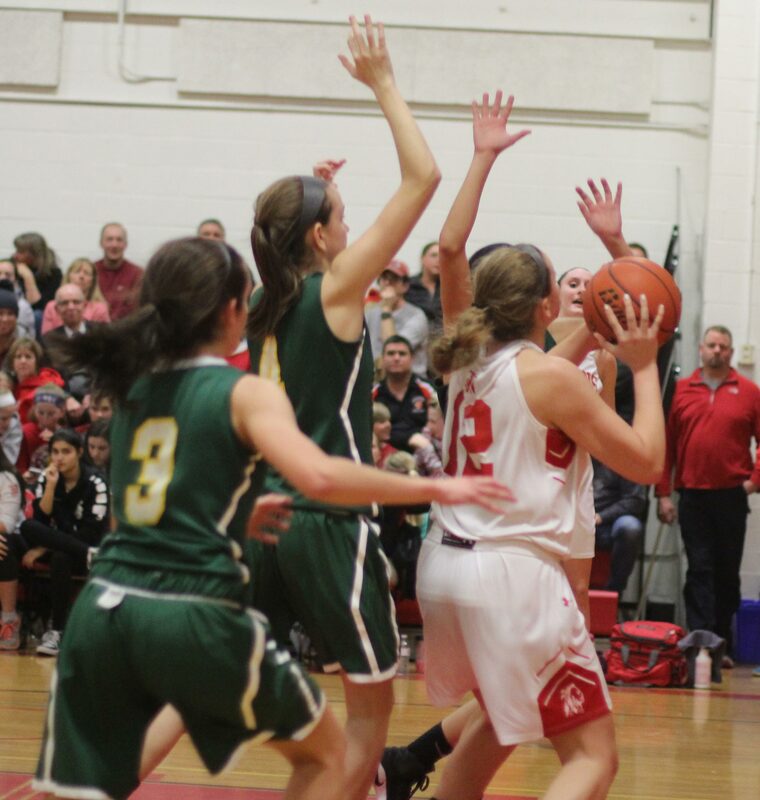 But Amesbury recovered and put together an impressive 19-1 segment over the next 10+ minutes of playing time and went from there to win, 48-34, on Thursday night in the quarterfinals of the Division 3 North tournament. 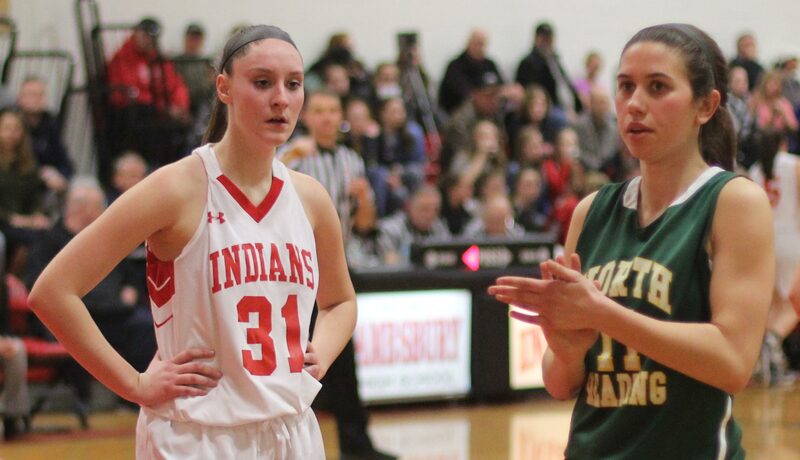 The Indians (20-1) will play the winner of tomorrow night’s matchup between Green Academy and St. Mary’s. 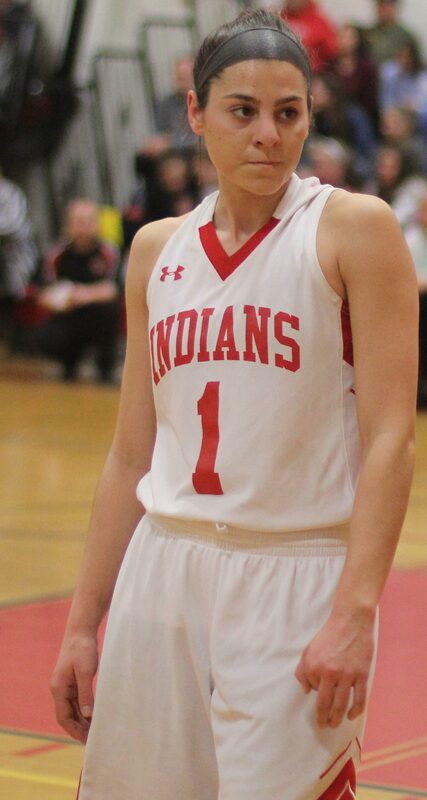 #8 seed North Reading got off to a rough start as senior Maddie Napoli (13 points) hit two three’s in the first 4 ½ minutes and the Indians led, 13-1. 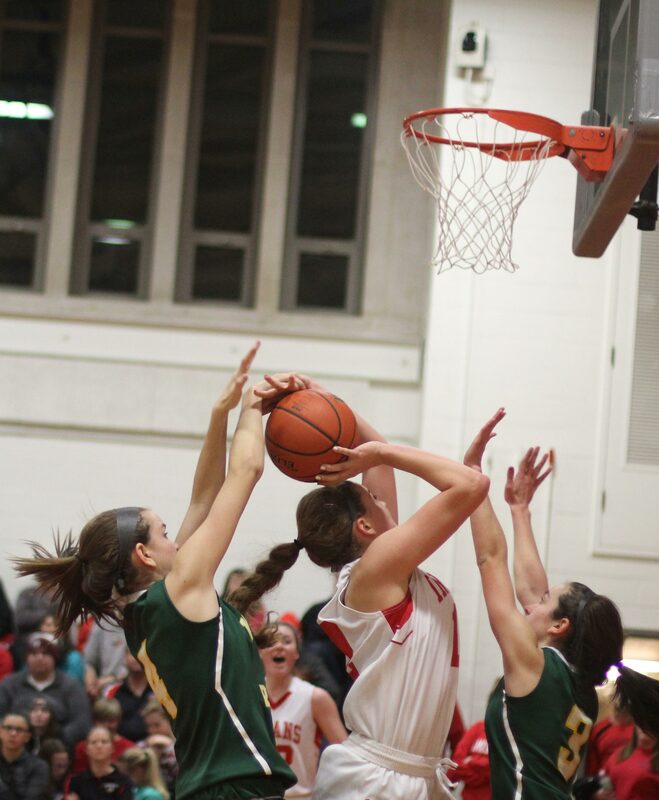 But the Hornets came all the way back riding the terrific play of senior Kat Hassapis. Kat’s three, halfway through the 2nd period, put the visitors in front, 18-17. The Indians finished the half on a 7-2 run, helped by two technical foul shots, to lead at intermission, 27-22. 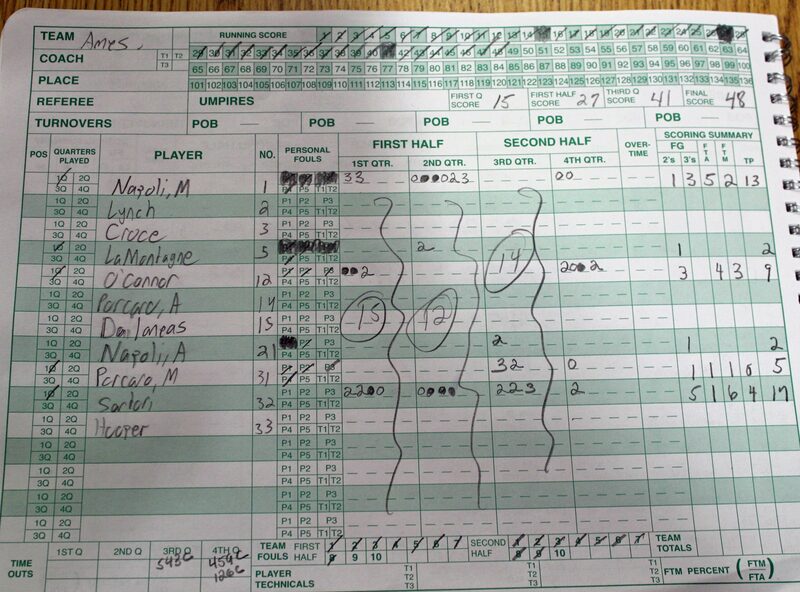 As I referenced before, Amesbury got into foul trouble early in the second half. Losing Flannery O’Connor was serious since the sophomore had twenty-three points in the last NR/AHS meeting and only had four points so far in this one. After the Hornets (11-12) knotted things at 27, the Indians took the game over for the next 10+ minutes of playing time. 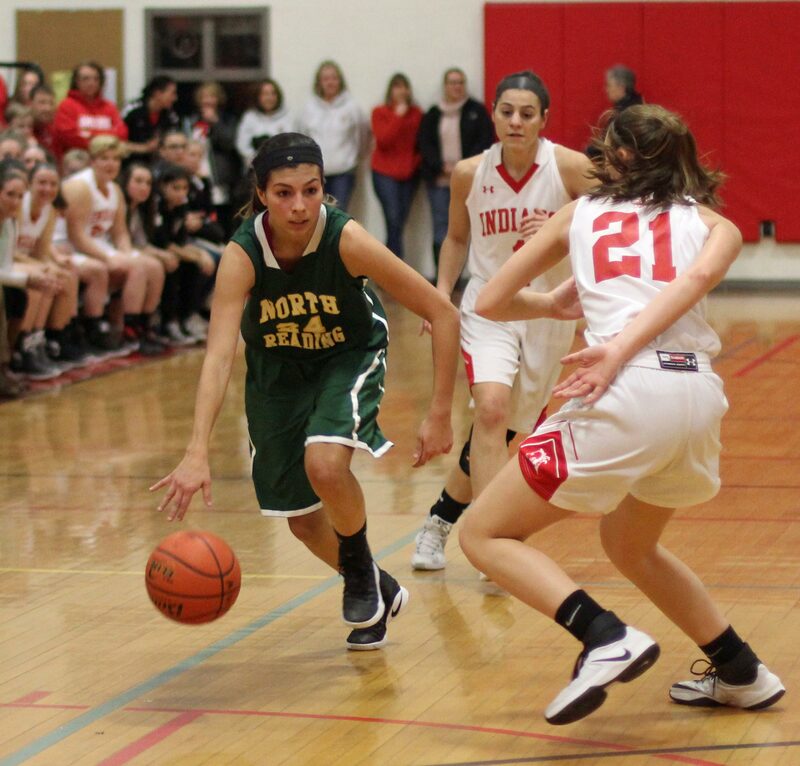 Ali Napoli and Chelsea Lynch replaced their foul-prone teammates and before long Amesbury was going one way and North Reading was going the other. 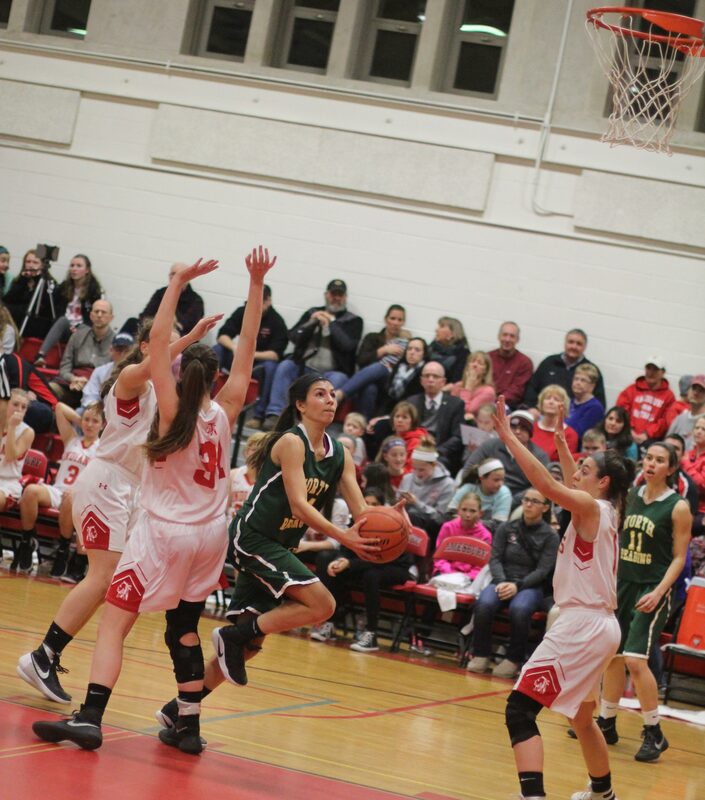 In the 19-1 breakaway time, senior Abbie Sartori hit three jump shots and one triple while freshman Ali Napoli made a neat move in the lane to get a layup and assisted on three of the AHS baskets. 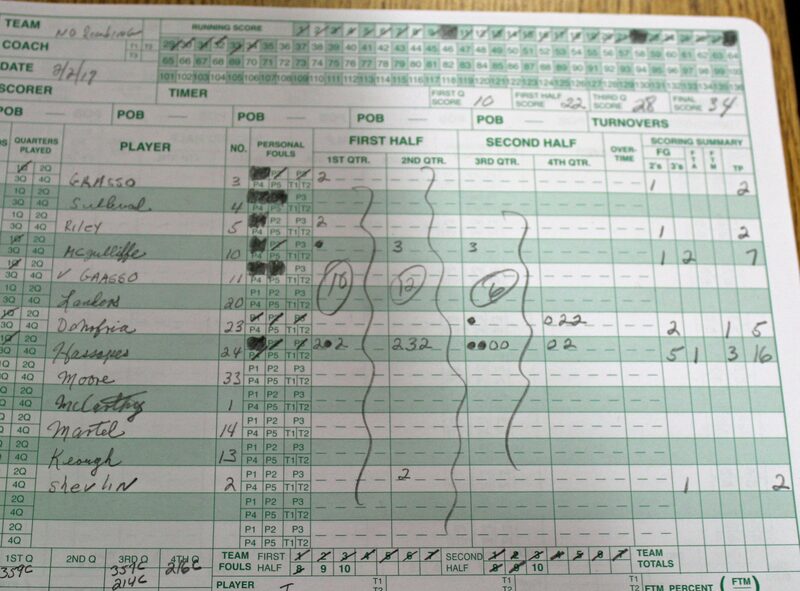 On the NR side, scoring was a big-time struggle. The Hornets missed five-of-six free throws and had seven turnovers. When North Reading finally made a field goal (Mia DeNorfio) with two minutes left, the visitors were down, 46-28, and the game had gotten away from them. 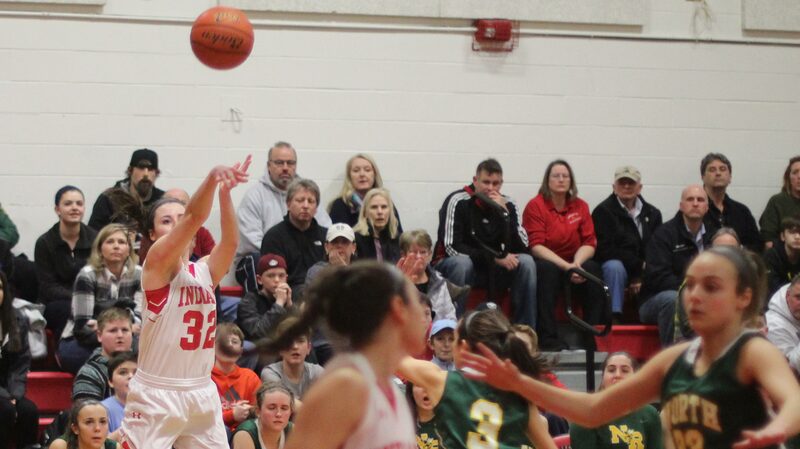 Mikayla Porcaro had a 3-pointer and a successful jump shot during Amesbury’s winning run. 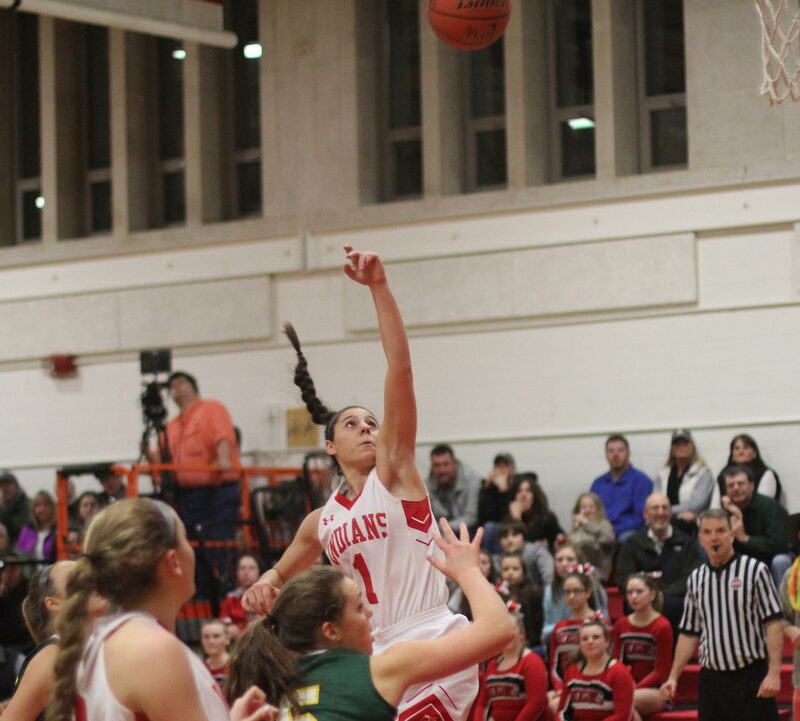 Abbie Sartori led all scorers with seventeen points. NR used a box-and-one to try to keep Flannery O’Connor from getting the ball. Worked quite well although Flannery found some room inside late in the game. 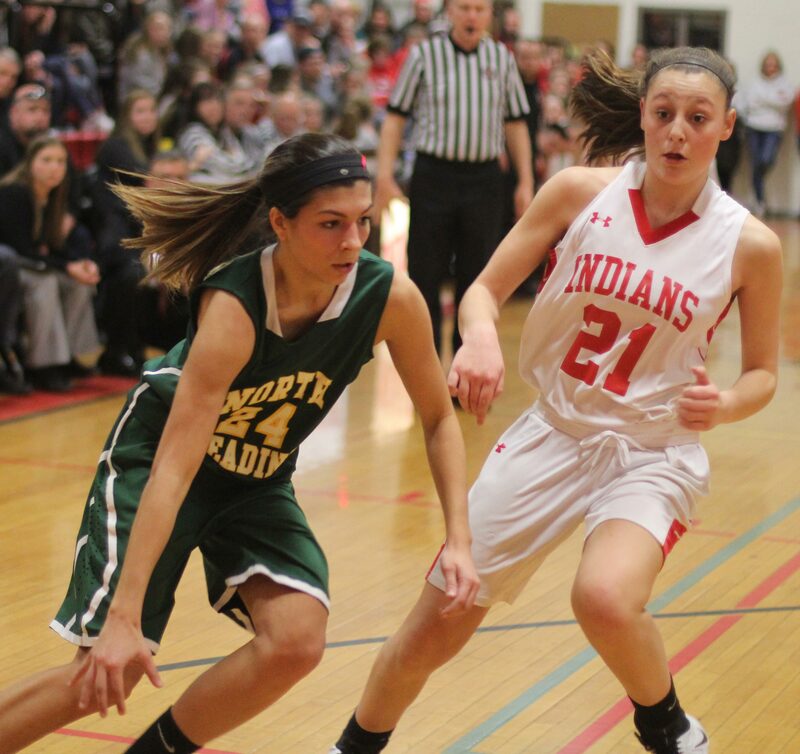 The Indians defeated North Reading, 72-57, on January 6th. The Hornets made eight three’s in the first half of that game. Amesbury’s 1-3-1 zone defense worked well this time around, however, by limiting NR to only three long ones in this tourney win. 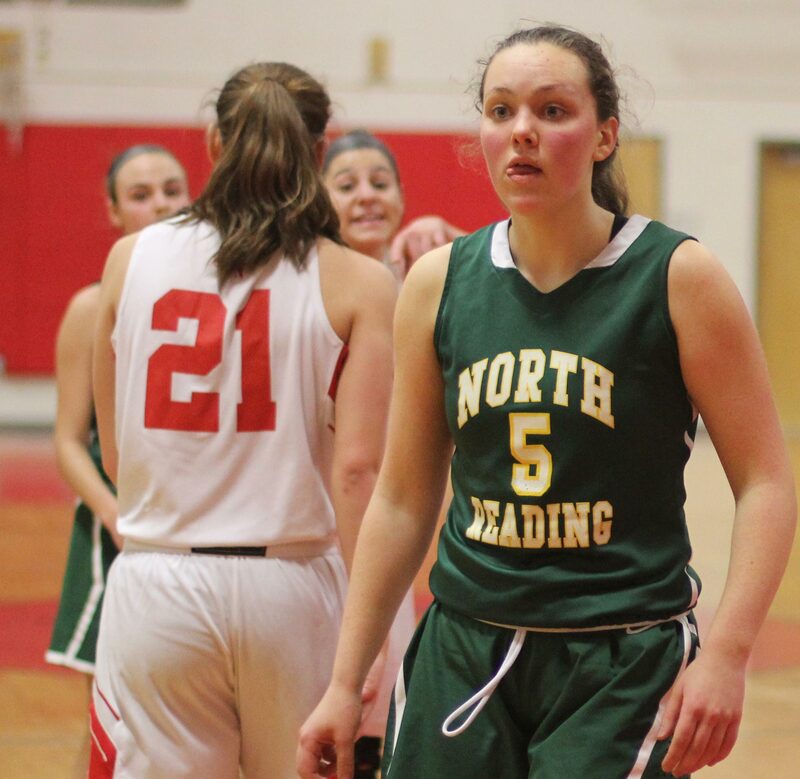 North Reading was called for a technical foul after a player entered the game and their name was not in the official scorebook.